Crowdsourced Boston bombing investigation: Reddit stands down. 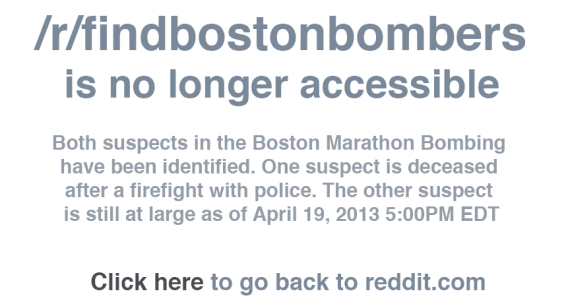 Reddit’s findbostonbombers page is no more. After a week in which Reddit’s r/findbostonbombers page rocketed to prominence—and controversy—as a hub for crowd-sourced criminal investigations, the FBI’s two main suspects are dead or in custody. And Reddit had nothing to do with it. As the screenshot above shows, the subreddit’s creators have now taken it offline. The act suggests they’ve been chastened. As the days passed and Reddit’s shadow investigation turned up one red herring after the next, its users and moderators increasingly turned a critical eye on their own and one another’s actions, and they began to see the harm that their well-meaning work had the potential to inflict. In the final analysis, the harm almost surely outweighed the good. Even President Obama, who has actively courted Reddit, subtly admonished the amateur sleuths in his press conference Friday night, along with those in the media who gave their findings too much credence. “In this age of instant reporting, tweets, and blogs, there’s a temptation to latch onto any piece of information, sometimes to jump to conclusions,” he said. “But when a tragedy like this happens with public safety at risk and the stakes so high, it’s important that we do this right. That’s why we have investigations. That’s why we relentlessly gather the facts.” By “we,” of course, he meant the law-enforcement professionals. But Redditors are, on balance, optimists. This will not be the last time that the site—or other online message boards—springs into action to see if its users can turn up something that the authorities can’t. It would be pointless to argue that they shouldn’t. Reddit may be owned by Condé Nast, but no old-media gatekeeper can control what its users—or those of other, similar sites—post. All anyone can do next time is remember the lessons of this week and treat the work of self-appointed gumshoes with the healthy skepticism it deserves.